Our firm recently had success in a birth injury case in Gwinnett County, Georgia. In that case we represented a family against the labor and delivery team that delivered their daughter and the hospital where they worked. Following her delivery, their daughter was diagnosed with Cerebral Palsy. The term “Cerebral Palsy” refers to several different kinds of permanent brain injuries that occur before, during, or shortly after birth. Victims of Cerebral Palsy can suffer a variety of symptoms including: limited movement, speech difficulties, learning disabilities, visual problems, hearing problems, and epilepsy, seizures or spasms. She suffered from many of these. By the time of trial, she was a ten year-old who suffered grand-mal seizures, had limited use of her right arm and leg, and whose intellectual development had stopped at the level of a three year-old. In her case, the jury was faced with two very different stories of how her injuries occurred. Our story was that she had suffered a hypoxic injury (lack of oxygen during delivery), and the defense claimed she had developed an infection. Although there was medicine and experts supporting both sides, the jury found our story the most credible. They returned a verdict for the family of $12.9 million. The purpose of this article is to provide three things: first, a primer on actionable birth injuries to give attorneys a very basic starting point if they have a parent who comes to them with a child who has suffered complications from delivery; second, an outline of the kinds of experts and their specialties that are often required to successfully litigate a birth injury case; third, a reminder to “keep it simple” when teaching complex medicine to a jury. There are several common types of injuries (and causes of injuries) that lawyers are referring to when they refer to “birth injuries”. The most common are the following: birth injuries that result from hypoxia (a lack of oxygen to the unborn baby); injuries that result from difficulty delivering the baby’s shoulder (called shoulder dystocia); and injuries that result from attempts to extract an unborn baby during delivery (forceps or suction injuries). Delivering the baby as quickly as possible using forceps or by Caesarean Section (C-Section). Umbilical Cord Complications: The umbilical cord is the baby’s lifeline while it is in the womb. It carries oxygen, blood and nutrients to the unborn baby right up to the point of birth. Umbilical cord complications can result from prolapse or compression of the cord. Umbilical prolapse occurs when the umbilical cord is “pinched” in the birth canal, cutting off oxygen to the baby. Umbilical cord compression occurs when the cord gets wrapped around the baby’s body during delivery, also cutting off or decreasing the flow of blood and oxygen to the baby. Birth injuries occur from umbilical cord prolapse or compression when doctors and medical staff fail to quickly free the umbilical cord from these dangerous positions leaving the baby to suffer a hypoxic injury. Brachial Palsy/Brachial Plexus Injury/ Erb’s Palsy: Brachial palsy occurs when the brachial plexus (the group of nerves that supplies the arms and hands) is injured. It is most common when there is difficulty delivering the baby’s shoulder, called shoulder dystocia. A brachial plexus injury could be the result of medical negligence at birth where the baby’s shoulders have been injured through the use of forceps and, in turn, the brachial plexus nerves have been stretched and torn. A similar condition, Erb’s palsy, results when the baby’s shoulder becomes stuck behind the mother’s pubic bone during delivery. Severe nerve damage affecting the neck and arm can result. Brain Injuries Caused by Forceps & Vacuum Extractors: Physicians use forceps and vacuum extractors, either separately or together, to help pull the unborn baby through the birth canal. Use of these devices to pull, twist, and manipulate the position of the unborn baby can result in traumatic brain and spinal cord injury, as well as skull fractures. II. The Role of Experts in the Birth Injury Case. Experts play a critical part in any birth injury case. You can expect both sides to employ a host of experts covering issues that span the child’s entire life – literally starting with what occurred in the delivery room all the way through the child’s current mental and physical condition. In our most recent trial, we employed virtually all of these experts. III. Keep the Medicine Simple. I believe the most important thing we did to achieve success for the family was to keep the medicine simple for the jury. “Simple” in the context of a complicated medical injury is difficult to do. I do not mean to suggest that you or your experts will never need to discuss complex medical terms or concepts. What I mean is this: your or your expert’s brilliant comprehension of the medical concepts in a birth injury case won’t do you any good unless you can teach these concepts to the jury. As lawyers, we don’t spend enough time reversing roles with our jurors and I have seen many fine lawyers become intoxicated with their own lofty and intellectual grasp of complex medicine. So what do you do? The medicine in a birth injury case is complex. First, both you and your experts will have to have a deep understanding of the medicine. In a birth injury case this includes the intricacies of the delivery process, how to interpret sophisticated medical test results, and the complexities of how an injury (your view) or an infection (the defense’s view) resulted in a damaged newborn. Next, you must teach the medicine to your audience. To do that you must do what all great teachers do — you must make the medicine accessible to your audience (the jury). In our case we taught through analogy; we compared a hypoxic injury to a swimmer being pulled under. Specifically we defined the disturbing signs on the fetal heart monitor strip as showing that the baby was being “pulled under water” with mom’s contractions and only had “seconds to take air” between the contractions before she was “pulled back under” again. We also taught visually — demonstrating concepts through 50 plus “boards” at trial including what fetal heart monitors do (“Fetal Heart Monitor Strips: Why are they important?”); how a labor and delivery team should work (“Labor and Delivery: What happens if the team doesn’t work together?”); and even simplifying our story of her injury into a simple equation (Oxygen Loss + Time = Brain Damage). In the end I believe our story of how she was injured by the labor and delivery team was both more understandable and more memorable than the defense’s story. Birth injury cases are complicated. They require a deep understanding of complex medical concepts. Presenting these concepts demands that the lawyer employ the most highly trained experts in a variety of disciplines, and the lawyer must understand these complicated medical concepts themselves. The story of the case must also be simple. Jurors (not doctors) will decide the outcome. For that reason, the lawyer who can explain complicated concepts through images, analogies, and even common sense has the best chance of helping the jury see the truth of their client’s case. Mr. Tyrone is a graduate of the University of Virginia in Charlottesville, Virginia and received his law degree (with honors) from the University of Georgia School of Law. Before opening his own practice Mr. Tyrone was associated with nationally-recognized law firms in both the areas of Criminal Defense and Plaintiff’s Catastrophic Injury work. Mr. Tyrone practiced for a number of years with the pre-eminent criminal defense firm of Garland, Samuel & Loeb, P.C., located in Atlanta, Georgia. During this period of his career, Nelson defended clients in a wide variety of major felony and white collar cases in both state and federal court. Some of the more notable cases that Mr. Tyrone was involved in were the defense of Ray Lewis, running back for the Baltimore Ravens, as well as acting defense counsel for the Gold Club located in Atlanta, Georgia, against prosecution by the United States Government. 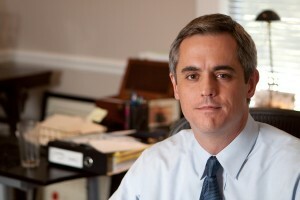 He next worked for Butler, Wooten P.C., with offices in Atlanta and Columbus, Georgia. While at Butler, Wooten, Mr. Tyrone worked primarily in the areas of auto products liability and medical malpractice. Over the span of his legal career, Nelson has tried more than three dozen jury trials in both state and federal courts in Georgia, Tennessee, South Carolina, Alabama, Ohio, Nebraska, and New York. Nelson has also been a frequent guest lecturer, speaking mainly on trial strategy and tactics in Georgia, Wyoming, and Texas. He is on the board and teaching staff of the Trial Lawyer’s College, which is located in Dubois, Wyoming, and was founded by famed attorney Gerry Spence.